Fayette County hit 10 three-pointers including one to sent the game into overtime on the way to defeating the Lithonia Bulldogs 69-62 in the Class 5A boys’ high school basketball semifinals at Columbus State on Saturday night. 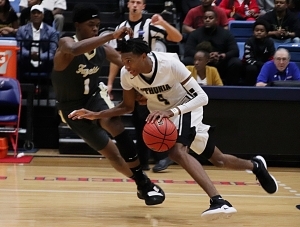 Lithonia was trailing 54-45 with 7:28 to play on Fayette County’s JeKobe Coleman’s layup when the Bulldogs turned things around and into a 13-0 run. Justin Myles offensive put-back started the run and Eric Gaines twice fed Zephaniah Corker for short jumpers and the score was 54-51 with 4:24 to play. Following a Fayette County turnover Gaines drove the lane to cut the lead to 54-53. Two more turnovers and Gaines converted three of four from the line giving Lithonia a 56-54 lead with 2:38 to play. Brison Rockcliffe’s pull up at the free-throw line gave the Bulldogs a 58-54 cushion with 1:28 to play. The Bulldogs went to the line twice with one-and-the bonus opportunities, but failed to convert. Ricky Knight hit one of two free throws to make it 58-55 and after the second miss at the line for the Bulldogs Fayette County found Knight open for a three. He buried it to tie the game with 5.4 seconds to play. The Bulldogs could not get a good shot before time ran out to send the game into overtime. Coleman opened the overtime with his fourth three-pointer of the game to start a 7-0 run for the Tigers. The run ended the Bulldogs season at 21-10. Eric Gaines finished the night with 16 points and 11 rebounds to lead Lithonia while Justin Myles hit for 16 more. Knight had 20 to lead Fayette County along with 16 from Will Richard and 15 from Coleman.